The following essay by Dylan Trigg was published by The White Review. IT IS OCTOBER 2010 AND I AM IN THE KITCHEN OF AN OLD HOUSE IN SUSSEX. FROM THE KITCHEN, A DOOR LEADS TO THE HALLWAY. SUDDENLY THE DOOR BEGINS TO SWAY FROM SIDE TO SIDE. AT FIRST, I THINK NOTHING OF IT AND PUT IT DOWN TO A BREEZE FROM ANOTHER ROOM. BUT THEN THE SWAYING BECAME MORE DELIBERATE, AS IF A PRESENCE WERE TRYING TO COMMUNICATE FROM AFAR. THE DOOR MOVES TO ONE END, PAUSES FOR A SECOND, AND THEN PROCEEDS TO RETURN TO THE OTHER SIDE. TO AND FRO IT MOVES, UNTIL SUDDENLY, AND WITHOUT WARNING, IT STOPS. AS I STAND TO INVESTIGATE, AN IRIDESCENT LIGHT FILLS THE HALLWAY, AND A TALL SILHOUETTE CLAD IN BLACK SLOWLY CROSSES THE LANDING BEFORE DISAPPEARING INTO THE BRICK WALL. IN RESPONSE, THE SKIN ON MY BODY BECOMES CLAMMY WITH ANXIETY, WHILE THE HAIRS BEGINNING AT THE BASE OF MY HEAD AND EXTENDING TO THE LOWER REACH OF MY NECK RECOIL, AS IF THEY HAD GRASPED SOME KIND OF HORROR THAT I WAS STILL IN THE PROCESS OF EXPERIENCING. ONE MINUTE LATER, I AM ON THE STREET. Disturbed by the vision, I look at the house from the vantage point of the outside. If the figure has come to me in a moment of private intimacy, then I am sure it would not follow me down the stairs and onto the other side of the street, and thereby expose itself to the public gaze. On the contrary, I am fairly convinced it is still inside, likely oscillating between the landing on the hallway and the kitchen, whereÂ â€“Â so I assumeÂ â€“Â it may have once encountered some kind of trauma that led it to being affixed to this place in time. How many other people had seen the figure since the conception of the house in the fifteenthÂ century? Numerous people no doubt through the centuries, each of whom will have had their own story to tell. In addition, all of these people will have had their own interpretation of the figure, from the seventeenth century interpretation of spectres as restorers of social injustices of the living to the nineteenth century interpretation of the such sights as a figure of death that refuses to die, thus offering hope that in an increasingly secularised age, life after death remains possible. 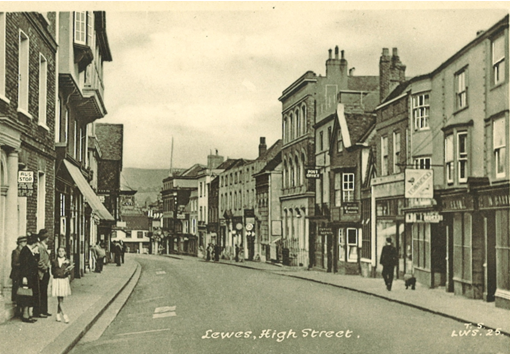 In all this, I may well form part of a historical community that will have encountered this vision in this particular place, 70 High Street, Lewes, Sussex. What did the figure want from us all: to testify to its mournful existence, to become its voice, or simply in the act of affecting another person, to remind itself that it still holds the power to form an alliance with the living? And why did it choose us? Are we in some sense more receptive to the troubled dreams of those who refuse to die than other people? Did the figure sense an anxiety within each of us that renders our senses more attuned to ambiguous forms of life? What is a ghost? The question has gained a particular value in the last decade or so owing to the influence of Derridaâ€™s concept of hauntology, a pun on ontology referring to the spectre of Marxism. As it is understood in a post-Derridean context, the concept refers to a broad range of cultural phenomenon characterised, above all, by a certain collapse in the spatio-temporal order, signalling the radical collision of old and new. It is a Ballardian vision of time, in which the end has already occurred and we are nowÂ â€“Â perhaps unknowinglyÂ â€“Â living in its shadow. Lynch’s “Surreal” Universe: Genre or Artists’ Movement?